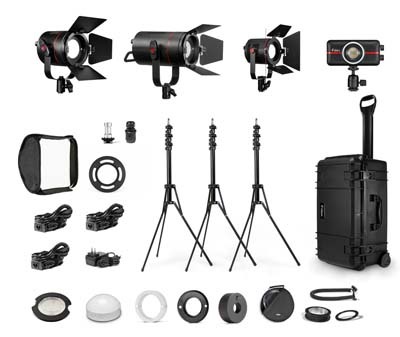 San Francisco, CA - June 9th , 2014 - Fiilex, a leader in LED lighting for the broadcast, film and photo industries, announces the release of their latest lighting kit, the K416. The kit features one P360EX, one P180E, one P200, and one P100. It also comes with the battery for the P100 and AC adapters for all the lights. This is the first kit to contain all of the standard Fiilex accessories, it comes with the: Dome Diffuser, Fresnel Lens, Gel Holder/Extender, Fiber Cap, Fiber adapter, 5' Fiber Glow, 15x15" Softbox, D-Tap Battery Cable, Ball Head Mount, three Light Stands, and a Wheeled Hard Shell Case. The P-Series lights contain Dense Matrix LED™, a patented technology, and the reason why Fiilex lights are different from other lights. Dense Matrix LED™ uses patented heat dissipation technology to pack numerous LEDs on a single array. The result of this compact placement is super–bright point–like illumination source that features high CRI (Color Rendering Index) and adjustable color temperature. This technology is unique to Fiilex and the other brands of DiCon Lighting. The K416 is available now from dealers throughout the US, Canada, and Europe. The US retail price is $3,495.00, for a complete list of dealers and accessories please go to www.fiilex.com.